On April 6,1941, Germany invaded the nation of Greece. It was forced to do so by the failure of the earlier Italian invasion to conquer Greece in October 1940. The Germans codenamed this invasion Operation Marita. When the German assault kicked off, most Greek troops were on the Albanian border fighting the Italians. Therefore, the German second front striking from Bulgaria immediately put Greek forces, as well as a small contingent of British Commonwealth troops, on the back foot. Greek forces on the Albanian border were quickly outflanked, forcing their surrender, while Commonwealth troops performed a tactical retreat with an eye to evacuation. Athens fell on April 27 within three weeks of the campaign beginning. Operation Marita ended three days later with the complete conquest of the Greek mainland. 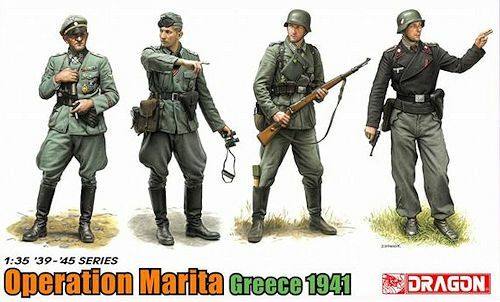 Dragon has released a new 1/35 scale figure set depicting German soldiers during Operation Marita in 1941. The four newly tooled figures are sculpted in lifelike poses. To illustrate their practicality for a range of settings, their uniforms show interesting variety such as NCO breeches and a tank commander’s jacket. Even the badges on their jackets are sharply molded. These four German soldiers will fit admirably in a figure or vehicle diorama depicting the Greek campaign, and in fact they’re versatile enough to fit any theater of that period of WWII. The Greek campaign is little covered by model figures, so this set is an invaluable addition for the modeler’s repertoire.